It’s no wonder tap dance is rising in popularity with new, innovative dance companies like Rhythmic Souls Tap Company on the scene. These fierce rhythm tappers are captivating local audiences with their unique blend of style, charisma, innovative choreography, and rapid-fire footwork. RSTC is on the cutting-edge of dance choreography with cross-genre repertoire that infuses rhythm tap dance with body-percussion, sand dancing, contemporary movement, flamenco, swing dance and anything else that might lend itself to their rhythmic persuasion. Whether it’s the classic elegance of Fred Astaire and Gene Kelly or the heavy hitting beats of Gregory Hines and Savion Glover, this company aims to bring the spirit of tap dance back to the stage and continue the legacy of an American art form. 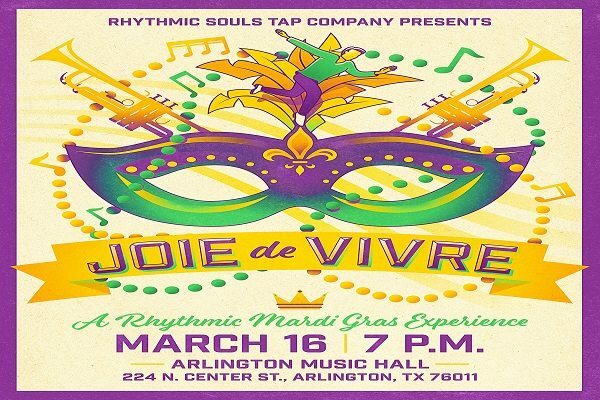 “Joie de Vivre” is our tribute to the rhythms and heartbeat of Mardi Gras. Come join in the experience as we entertain you with art, music, and lots & lots of tap dance. Be prepared to celebrate with us as we pay homage to the essence of the Mardi Gras culture while adding our own unique rhythmic spin. Laissez Les Bon Temps Rouler! We’ll see you there!